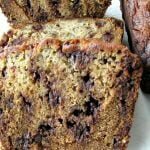 Sweet, moist, one bowl Chocolate Chip Banana Bread, more like a cake than a bread, is easy to make and great for dessert. To be honest, I’ve never been a fan of bananas. I will only eat them if they are just ripe, not mushy at all, so I rarely eat them. I buy them for the kids (my daughter and the ones I babysit), and they usually eat them, but this week I ended up with five bananas sitting on my counter for too long. 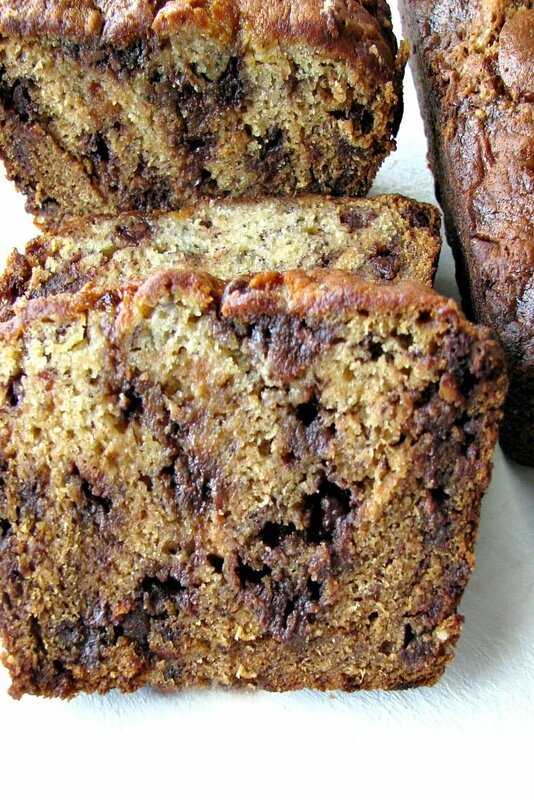 Even though I don’t like eating bananas, I’ve always loved a good banana bread, or better yet, a chocolate chip banana bread. This might be the best banana bread recipe ever! 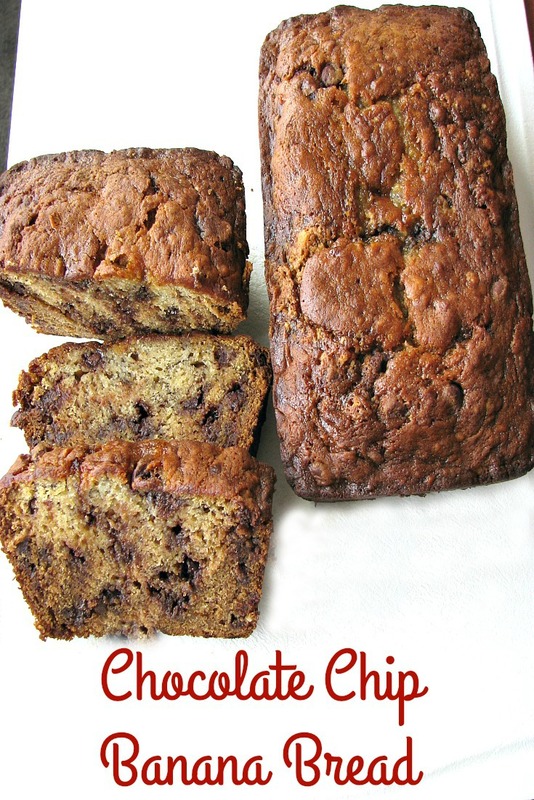 It’s an easy banana bread, it’s a moist banana bread, and it’s a chocolate banana bread. Perfect, right? I can’t take complete credit for this recipe. I based it off of Simply Recipes Banana Bread. Elise says it’s been the post popular recipe on her site for over 10 years, and I can see why. First, mash the bananas with a masher or the back of a fork. 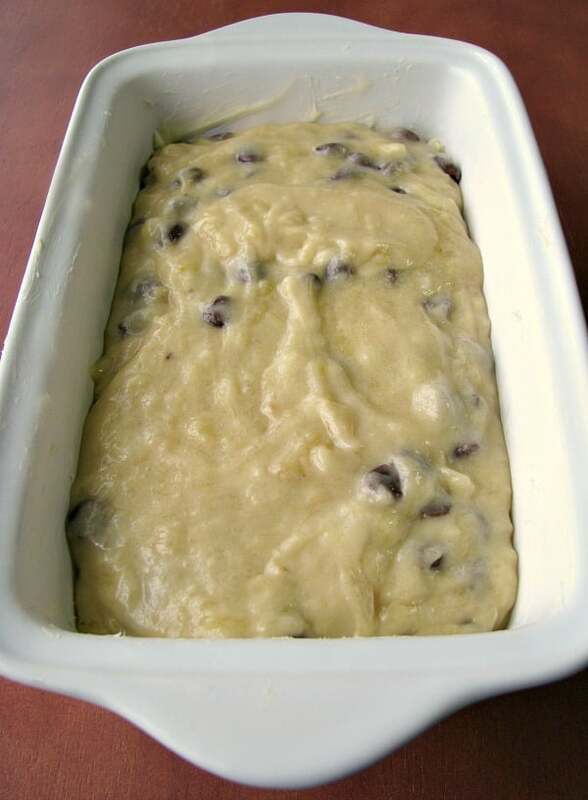 Combine the mashed bananas with flour, sugar, melted butter, along with the rest of the ingredients all in one bowl, then fold in chocolate chips, and pour into buttered loaf pans. Yes, this recipe makes enough for two loaves. You can give one away, or keep it all for yourself! Bake for about an hour, or until a toothpick inserted into the center comes out clean. Cool on a wire rack, then wrap tightly with plastic wrap or place in an airtight container to store. Preheat the oven to 350 degrees F. Grease two loaf pans with softened butter. 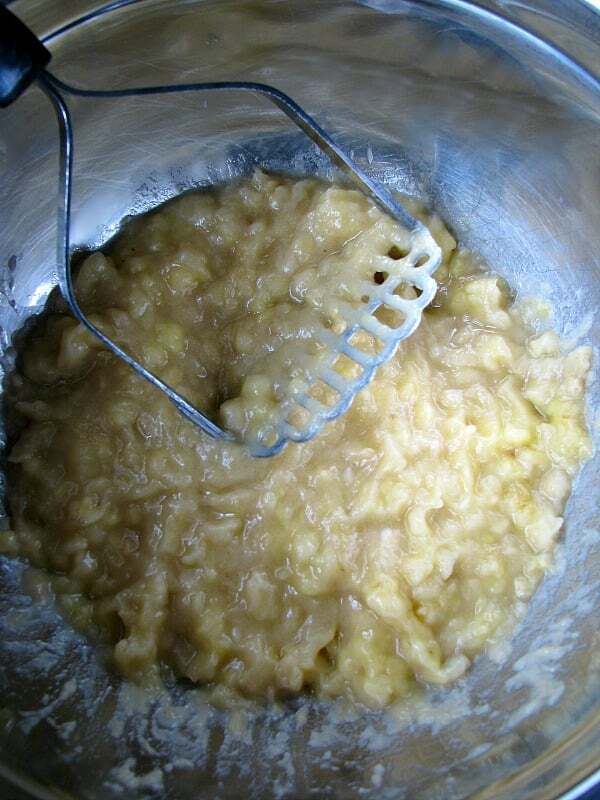 Mash the bananas in a mixing bowl with a potato masher or the back of a fork until smooth. Stir in the melted butter, flour, sugar, eggs, vanilla, baking soda, and salt. Stir until completely combined and no fleck of flour remain. Fold in the chocolate chips. Divide the batter evenly into the loaf pans. Bake for about 1 hour, checking after 45 minutes with a toothpick inserted into the middle comes out clean. If the outside is browning too quickly, turn the heat down to 275 for a while to complete cooking the middle of the breads, turning back up for the last few minutes if needed. Allow to cool for a few minutes, then carefully remove the loaves to a wire rack to cool. Serve warm or allow to cool completely, then wrap tightly with plastic wrap or store in an airtight container for up to 5 days.